Trains aren't my thing.. – british. foodie. dreamer. All I feel the need to announce is that WE MADE IT. This morning we slept in and had a bit of a relax after the drama of Wednesday. I didn’t end up getting out of bed until about eleven although Louise had been ho for hours and had showered and was ready. We felt pretty rested. So we checked out for the second time and left our heavy bags in the luggage cupboard whilst we headed off to have 北京烤鸭 (Peking Duck) at a local restaurant. And it was fantastic. I’m a little sad to say that we were more impressed with the actual place than the food because it was an old courtyard filled with tables and decorated beautifully with Chinese light shades and lanterns. After that we went for a quick visit to the Temple of Heaven. Though it was not as impressive as the Summer Palace it was lovely because it was surrounded by a big park. The colours of the temple stood out brightly compared to the Imperial Palace Temple which was awesome. So anyway, we got back, got our bags and head off to the right station to take us to Shanghai. We gave ourselves three hours to make it, overcautious but oh well. We got yummy fresh smoothies in the station. 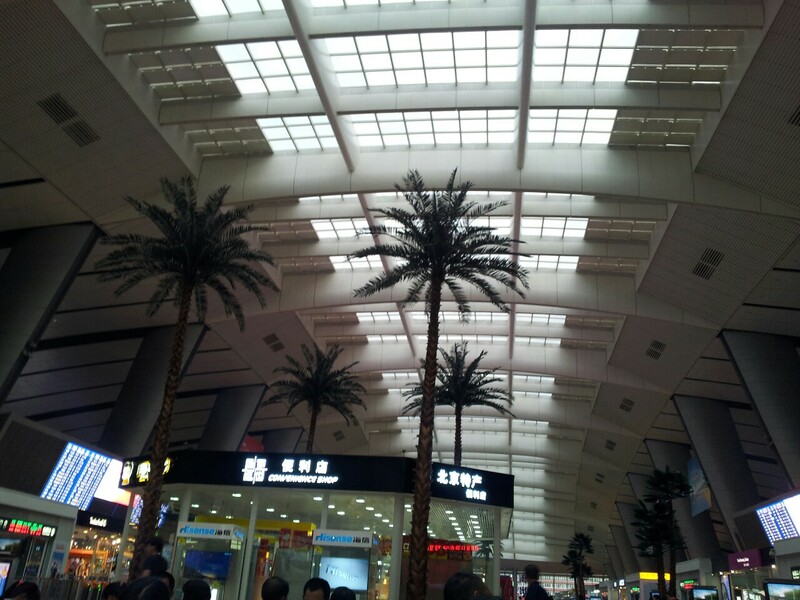 It’s quite funny how the Beijing South station was so much like an airport. There was a section full of shops downstairs when we came up from the metro and then the main floor up stairs to check in then you sit and wait until half an hour before the train departs before you can board it. Whilst sitting and waiting for the train the girl sat opposite us started speaking to us in English because she’s studying English and French at university. I wish I had used is opportunity to speak mandarin, but I guess the conversation would’ve been way more successful in English anyway. Funnily enough she’s working at an interpreter for someone from the University of Nottingham who’s over in China doing research. How weird eh? Small world.. She was really nice and I gave her my email if she was ever going to come to England in the next three years whilst I’m at the University. The last bit of our day was boarding the train which was simple and exciting. It hit us that we had actually managed to get on the train and we were on our way to Shanghai. The cabins are pretty good. There are four bunks and a alley in the middle. I don’t really know what the difference is between hard and soft sleepers but I can’t imagine there being much difference. These beds are the hardest so far (which is a not a surprise really) and I’m praying I get loads of sleep. All in all I’m glad we’ve made it. I may just sleep in Guangzhou though. I have cheekily booked a double room for myself. So the bed better be amazing. I fear I’m turning into princess and the pea on this trip. The best thing so far on the train journey was Louise casually saying: “This gum is for clean and white teeth, my toothpaste is for clean teeth. I may just stick to this gum.” if only it was that easy eh? Anyway, goodnight to you all.